It’s got to have something to do with the chicken and/or the pasta – which are great on their own, but are sometimes lacking in the color department. In times when you are craving some extra antioxidant boost, try dressing up your pasta with various combinations of veggies from the salad bar. In our Festive Cajun Chicken Pasta, we used peas, corn, and mixed greens—feel free to use any bite-sized vegetable you find: sliced mushrooms, shredded carrots or zucchini, olives, asparagus, beans, or diced bell pepper, to name a few. 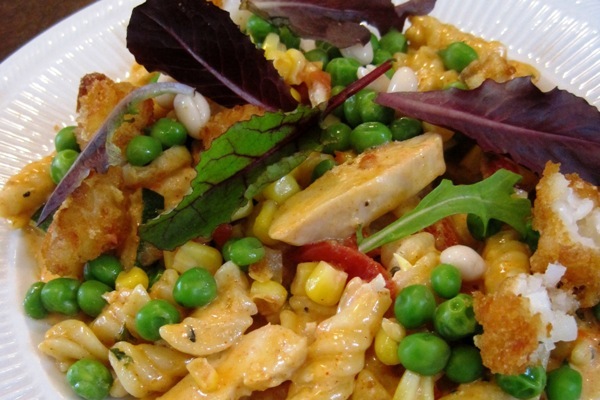 Toss pasta with green peas, yellow corn, and tater tots on a plate. Microwave for 20 seconds to heat through. Garnish with mixed salad greens.